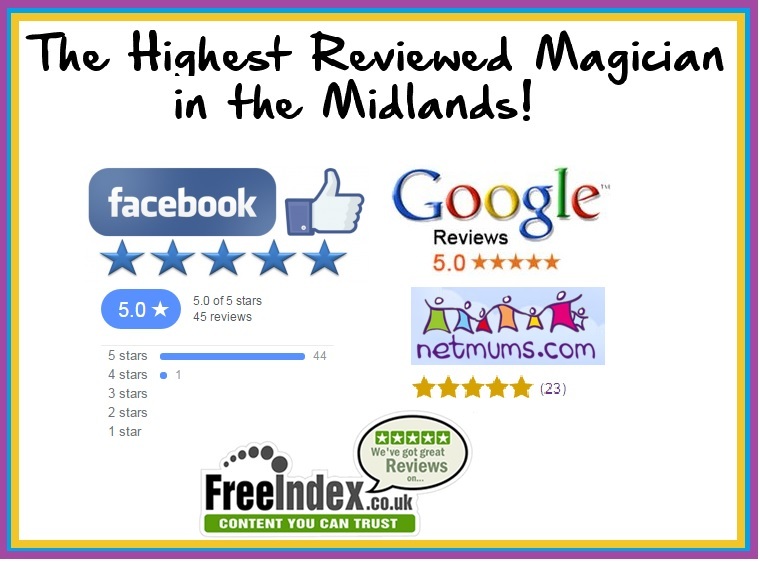 Award Winning magician Alex Michael; he performs at lots of children’s parties in Kimberley Nottingham and is known as a brilliant children’s entertainer and magician. He is recommended by lots of satisfied parents and known as very reliable. Alex magic the children’s magician offers different options for birthday party packages to suit your needs in the Kimberley area, these are aimed at children from age 3 and upwards. A 40 minute magic show aimed at children from age 3 and upwards, this has lots of children participation, fun and interaction. Alex’s great magic will keep the little ones fully entertained. The magic show includes counting, items disappearing and appearing. Alex will make sure the birthday child is the main star of the magic show and he will make them a crazy balloon hat. On top of the 40 magic show, Alex the magician offers a mini disco and games, this includes music, spinning plates, lights, parachute, limbo and prizes for the winners of the games. This will fill a magical 2 hour party in Kimberley Nottingham. Alex Michael is very well known in Kimberley and performs his magic show at over 150 childrens birthday parties a year, he gets many repeat bookings. Alex is CRB checked and fully insured through Equity, so you can be sure there is nothing to worry about when booking him. He can provide great references from satisfied parents. Magician Kimberley Nottingham, Children’s birthday party Magician.